Very, very nice (as usual!). While a wood display was certainly a possibility, it appears overwhelming... the cloth or a textured field to display prints is much more pleasing, to my eye anyway. A light pallet may be safe to assume, but I also question whether the wall plaster would not have been tinted. But then again, just about everything concerning the project is anyone's guess since it never progressed beyond sketches. The room would have most likely been a private concern (they did have a vault at their country estate and their house in town has been considered a likely location). The museum had already built a Japanese court by this time and there is credible belief that the print room actually was Wright's inevitable response to it. Regardless, the collection is rarely seen by the public to this day. Wonderful addition to the list! A beautiful, beautiful job, no ? Satisfying in virtually every aspect. A pleasant surprise is the contrast between the warm tones of the architectural environment and the rich blue found in the prints. And those prints are hung with exquisite care, making a very nicely-composed ensemble. One is struck, at last, by the pale quality of the rendering---but this is surely preferable to a denser effect which would have emphasized the wood grain in places where that might have been desirable ? Finally, the furnishings, the lovely hanging light fixtures, the rug and that great Roman-brick chimney breast, are all just so fine . . .
JimM, as I posted earlier (page 11), the gallery, according to Julia Meech, was to have been built in Wm. Spaulding's mansion at 99 Beacon St., NE. The building is still there, though it was remodeled into 3 separate multi-family structures long ago. An aerial view shows that it originally was constructed in a U shape around a court (now filled in), which could have accommodated the gallery. David, wonderful job! I like that you posted alternatives for the display walls of wood and cloth. Frankly, I cannot make up my own mind which it would have been. Thank you so much, David, for sharing your nothing-short-of-wonderful work with us. It is such a pleasure - and treasure - to be able to view buildings, rooms, and furnishings we could never have otherwise. Congratulations on another truly such marvelous work! Chad and I are very happy with the result. an aura, to have founded a faith, based on oneself and on a Vision . . . so that one's attendants can spread the word, and make it stick ? superfluous delights like a row of labor-intensive perfs is faithfully carried out, when all the man's family really needed was shelter . . .
that this is what the client wanted and was willing to sweat and toil for, over a period of seventeen years. functions as a habitable and lasting dwelling. Roderick... safe to assume Meech's reference to the "Back Bay townhouse" and Beacon Street are one in the same? By "in town" I was deferring to her and that location, as opposed to their country estate with the vault. 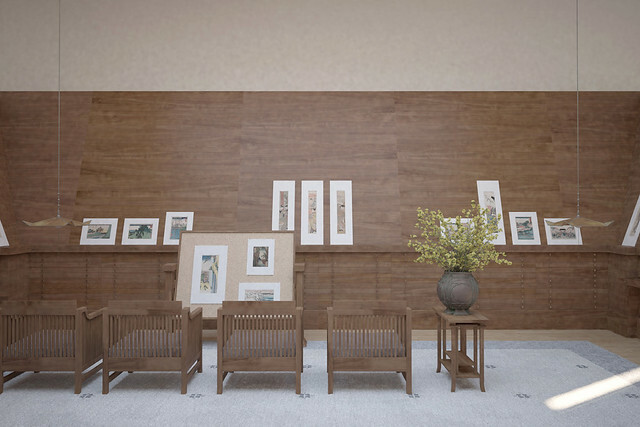 Meech does make clear she believes Wright's design was speculative and thought Wright may have been "goaded" by the interiors of the Fine Arts' Asian galleries. He certainly had hopes for the room, enough so to retrieve the plans from the Spaulding's in 1918, and sending them on to the Met in New York. The only response was their immediate return. A serene, almost temple-like space. Wright saw nature as divine and capitalized the N. Was the print seen by him as a form of scripture, perhaps?